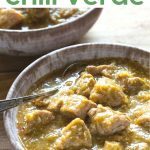 BEST Pressure Cooker Chili Verde Recipe! 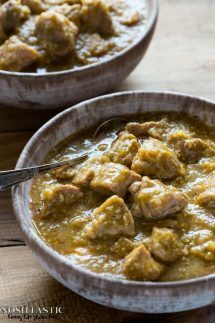 Pressure Cooker Chili Verde is another family favorite we make in our instant pot as the cook time is drastically reduced from making it in the oven and you still end up with wonderfully flavorful, tender, fall apart, chunks of pork that simply melt in your mouth! My recipe for Pressure Cooker Chili Verde is cooked with tomatillos, Anaheim peppers, Ancho Chili powder and plenty of garlic, that gives it a deliciously rich flavor that’s pretty hard to beat! If you can’t find Anaheim Peppers then you can look for a Poblano Pepper instead, or sometimes the grocery stores might label them simply as Long Green Peppers. A gas stove is the best way to blacken your peppers, but if you don’t have that you can broil them in a similar fashion. Due to the liquid in the tomatillos there can be a lot of sauce and liquid when you first open your cooked pot of pressure cooker chili verde. I find it’s best to put it on the ‘saute’ or browning setting on your pressure cooker and let it reduce further with the lid off. You will need to roast the Anaheim Peppers over a gas flame to blacken the skin like you see in the image below. if you don’t have a gas stove then you can do this under the broiler. You want the skin to blacken and blister like you see in image 1 below. use tongs to keep turning it like that a few times. Once blackened put the green peppers in a bowl with cling wrap over the top and the steam will help the blackened skin to peel off. Once you have peeled them remove the seeds and stem and add them to your food processor or blender. Peel the papery outer skin from the tomatillos and if they are sticky you can rinse them. Halve them and place in a large bowl with onion slices, garlic, then toss with about a tablespoon of olive oil and place on a baking sheet (see photo 2 above.) I lined mine with parchment for easy clean up and so that they don’t stick. Broil for ten minutes or more until they get a little toasted on top (see pic 3.) you will need to watch closely so that they don’t burn, you don’t want them blackened like the chili! Add the broiled tomatillos, onions and garlic into your food processor or blender with the peeled and chopped Anaheim peppers and blend to make the chili verde sauce. Pressure CookerYou’ll need a pressure cooker to make this recipe, there are many brands that work well but we are love our Instant Pot! Blender – I have a great blender that I use for lots of recipes and smoothies, It works perfectly to make the chili verde sauce. Ancho Chili Powder – I love the flavor this adds to our pressure cooker chili verde recipe, it’s just a little different to regular chili powder. Pressure Cooker Best Ever Chili! 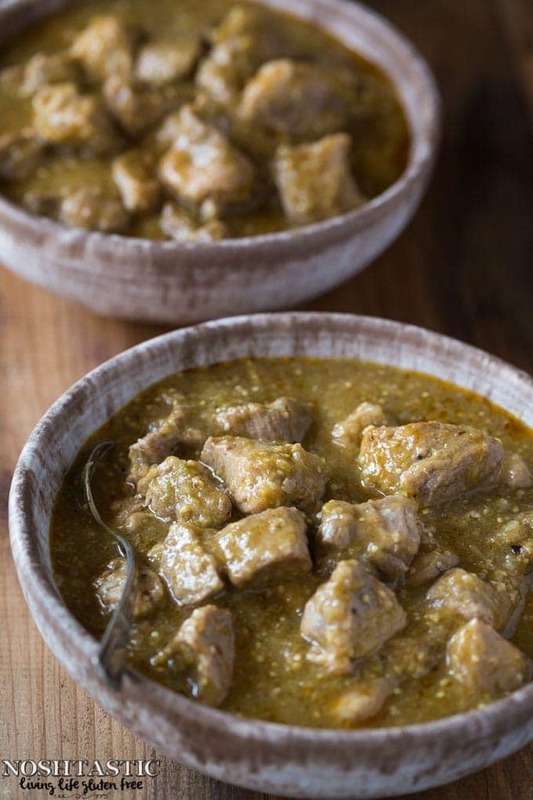 Simple and easy to make, this Pressure Cooker Chili Verde that is melt in your mouth tender! Watch the recipe video, you'll find it after the directions. 2 Anaheim peppers , skinned, seeded and chopped. Don't miss the recipe video! It's right after the directions. Roast the Anaheim peppers over an open flame on your gas stove, use tongs to turn them so that they blacken all over. If you do not have a gas stove you can broil them in a similar way. Put the blackened peppers in a bowl with cling wrap over the bowl and the steam will help the skin to slide off after a few minutes. Once you have peeled the peppers, remove the seeds and stem and add them to your food processor or blender. Remove the outer husk from the tomatillos and wash and halve them. Add the halved tomatillos, onion slices, and garlic into a large bowl and toss with about a tablespoon of olive oil, then place on a baking sheet and broil for about 10 minutes or until they get a little toasted on top. Add the tomatillos, onions, and garlic, into your food processor with the chopped Anaheim peppers and blend to make the sauce. Cut the country style ribs into large cubes. Turn on the saute function in your Instant Pot or pressure cooker and add the oil, then brown the pork in batches. Add all the pork back to the pressure cooker and add the salt, pepper, and Ancho chili powder and stir. Pour over the chicken broth, then the chili verde sauce, stir and put the lid on. Lock the lid, turn the steam release vent to 'sealing' and using the 'manual' or 'pressure cook' button, adjust it to cook for 20 minutes at High Pressure, then let the pressure release naturally for about 10 minutes or more. The Chili Verde may have a lot of liquid when you first open the lid, I like to simmer it using the saute button to reduce and thicken up the sauce which gives a nice rich flavor to the finished dish. You will need a food processor or blender to puree the tomatillos for the sauce. This chile recipe is not particularly hot so if you want to make it hotter you could add a couple of seeded fresh Jalapenos (or hotter chilis if you're game!) to the food processor with the tomatillo sauce, or simply add some hot sauce or extra chili powder. My family will not eat it if it's very hot so my recipe reflects that. I was surprised how thin and runny this was. When I order it in a restaurant, it’s always thick like a stew and doesn’t taste anything like this. I’m sorry you didn’t like it Denise, it’s a pretty standard recipe for Chili Verde with all the usual ingredients. 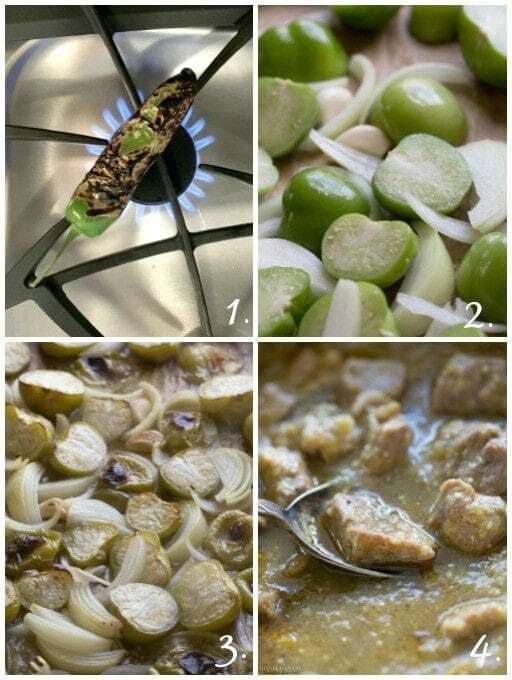 Did you read step 12 which says “The Chili Verde may have a lot of liquid when you first open the lid, I like to simmer it using the saute button to reduce and thicken up the sauce which gives a nice rich flavor to the finished dish.” It sounds like you didn’t simmer it for long enough to thicken up. My family loved this recipe for Instant pot Chili verde, it really was fantastic and we love that it’s gluten free too! I will say it’s worth simmering it a bit after you take the lid off to reduce the liquid, but it didn’t take too long. I love your Recipe that only think I don’t agree is that this recipe is Mexican cuisine not American. Duly noted! It’s really just a category for my website for people who are using the search function.